These people did NOT do this crap last year. Why do I have to live next door to this? Is it just me or does it look like Jesus and Mary are riding on a flying carpet and that the animals are being strangled by blue tinsel? I win the tackiest neighbor award. Hands down. Wow...I always wonder if these people see the same things we see....that is BAD!! Holy geez! I am so sorry! That is horrible! yes that is definitely your award! So weird -- what the heck is going on with the animals and what is with the blue garland?! it doesn't match ANYTHING. Oh my god I'm dying laughing right now... that is so awful!!!! Isn't it awful when your neighbors true colors come out in tacky holiday decor. LOL! So that's what you do with leftover tinsel. That is AWFUL! It looks like Jesus and Mary are hanging animals from a cherry picker. That's some kind of Christmas celebration! OMG... that's hysterical. It almost doesn't make any sense. It's like they didn't know what to do with the stuff so they just tinseled it all to a tree. WTF?! before I read the rest of your post I literally said out loud, "are they strangling those poor animals?" that is hilarious but sorry you have to live nearby! Wow! Poor Mary & Joseph! This. is. hysterical. I have one of these on my street, but its got NOTHING on yours! I'm so sorry you have to look at that everyday. That's just terrible. 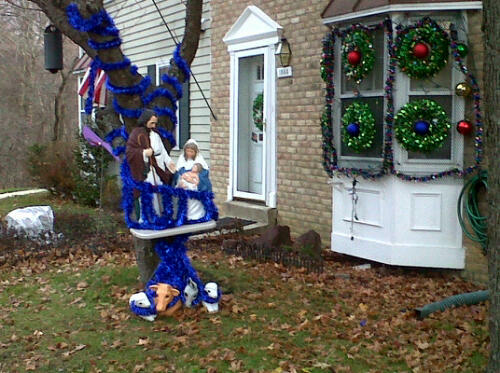 Wow, yes, you do win the tackiest neighbor award. Hands down.